I had expressed to Duc one day that it had been years since I had ventured to downtown Pasadena so in an effort to re-expose me to the wonder that is the street of Colorado Blvd and its offerings, he set aside a walking plan for us both which included an early dinner stop at a restaurant whose name he didn't want to reveal to me. That restaurant turned out to be Union which is a sweet 50-seat modern take on northern Italian cuisine combined with the power of sourcing ingredients locally and responsibly. The seasonality of the menu reflected the nuances of Californian cuisine and produce as transposed on what would be classically northern Italian food. I for one am a big fan of both styles so was pleasantly surprised not only with the intimate but chic decor inside but also the food and service. Once you walk through the doors, you immediately notice the oversized chalkboard on the wall exclaiming the restaurant's dedication to sourcing as locally as possible as well as the different farmers' markets they are proud to support. 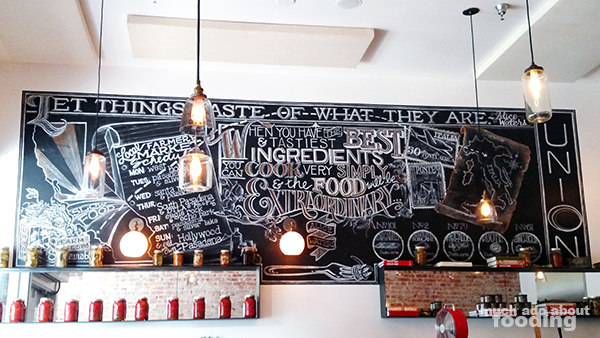 We've seen more and more of these chalkboard menus and artwork in restaurants throughout the years so it wasn't too shocking to find the trend in a Pasadena spot. Lightbulbs in glass jars hung from the ceiling as quaint DIY lamps, and the simple cut stalks of billy balls in mason jars as table centerpieces contributed to a feeling of being at home with good friends over a meal rather than out at a fancy restaurant. 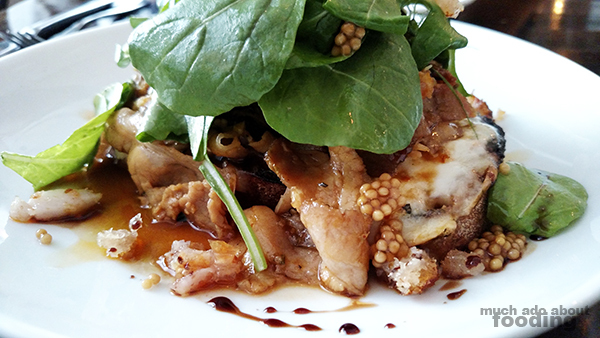 To start, we went for their Porchetta Crostone ($15 - smoked mozzarella di bufala, arugula, and pickled mustard seeds) because who says no to porchetta? We both wished that the mozzarella in this dish hadn't all been melted on the bread seeing as fresh mozzarella is a treat in itself but the other fresh ingredients around were great additions. The porchetta pieces were smoky and tender with accents from pickled mustard seeds - there was a nice play between acidic and peppery bitter. 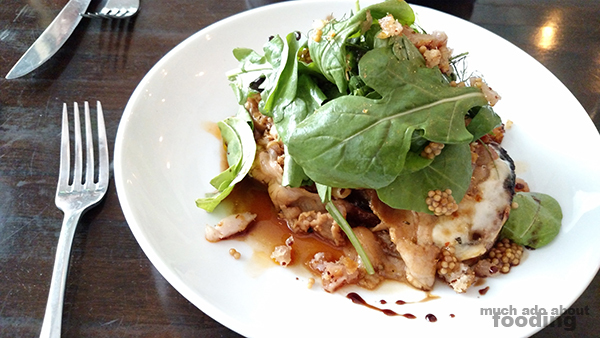 As an appetizer, it was a bit difficult to share but we managed. Choosing our entrees was a little difficult seeing as so many items sounded appealing. However, once I locked my eyes onto a mushroom-heavy dish, I knew it would be my choice. 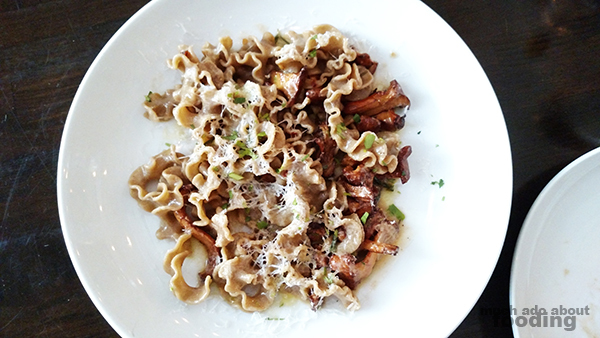 Union's Porcini Lasagnette ($22 - golden Chanterelles, rosemary, and Parmigiano-Reggiano) caught my fancy and its arrival on the table in front of me received some hungry eyes. Full of flavor and abundantly stocked with mushrooms cooked well, this dish is certainly for the mycophile and for any who appreciate the unique texture of lasagnette. The stylized thin noodley pieces were a good fit with the curled shapes of many Chanterelles, and the rosemary just highlighted the woodsy taste of everything all together. 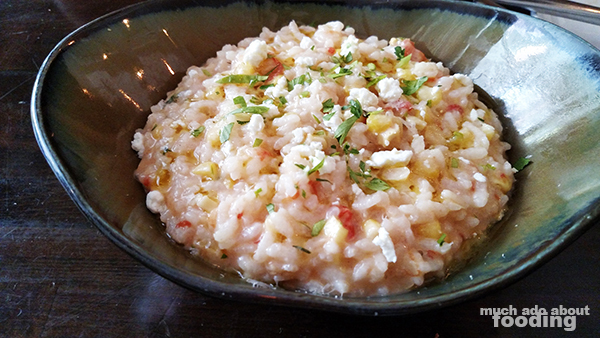 Duc opted for their Smoked Sweet Corn Risotto (heirloom tomatoes and Drake Farms goat cheese) because where I am weak to mushrooms, he is falling on his knees for sweet corn. I wouldn't categorize the item itself to be an authentic risotto but obviously fashioned in the same style. There were generous amounts of sweet corn mixed into the rice grains and the tomatoes mixed in along with freshly cut herbs gave the bowl overall a very fresh, garden taste to an otherwise potentially heavy dish. Goat cheese also helped with its levity, and Duc was hungry for more once he swiped the bowl clean. Satisfied with our meal, we did not resist our server when he brought over a dessert menu. Though we initially wanted to step outside and explore more of Pasadena with perhaps a stop at an ice cream, several items on Union's ending list made us reconsider previous plans. 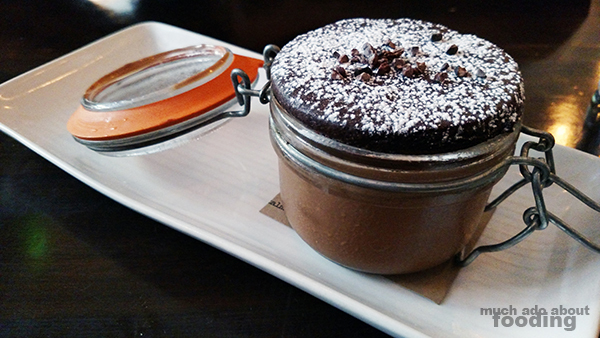 We ended up with their Olive Oil Cake ($8 - citrus gastrique and salted honeycomb gelato) and Gianduia Chocolate Budino ($8 - cocoa nib, truffle salt, and olive oil) to get a balanced perspective on their dessert variety. 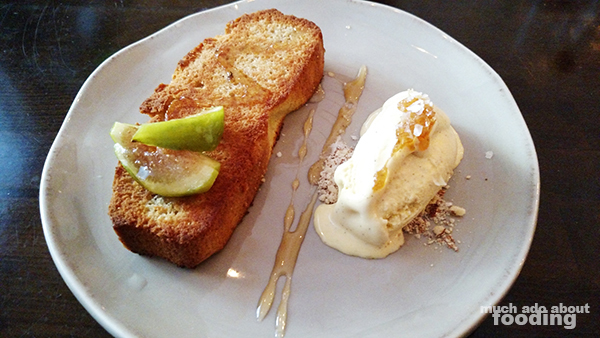 The olive oil cake was bit too dense for both of our liking but fresh sliced fig combined with an extraordinary honeycomb gelato really helped. Then there was the budino which was a perfect balance of hazelnut and chocolate that spread in our mouths very coolly and smoothly - a dessert not to be missed. 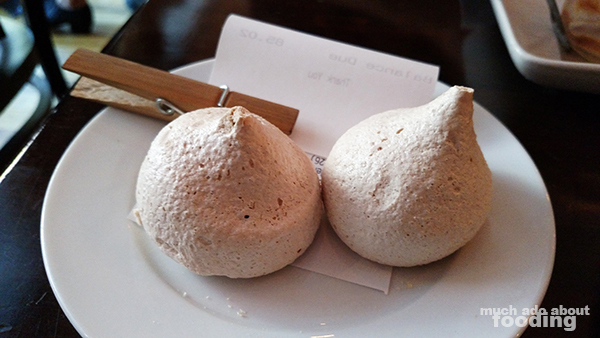 The meal ended with two meringues upon our check that melted instantaneously in the mouth. I'm willing to come back to Union to see what else is on their menu in the future as it changes frequently! Photography by Minerva Thai (phone).